In summer of 1988, Ruhollah Khomeini issued a fatwa to massacre political prisoners who were serving time in prisons across Iran. None had been sentenced to death. 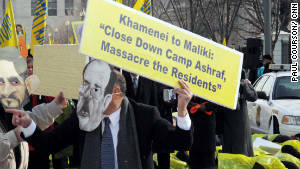 CNN - December 12, 2011 - Several prominent Americans joined Iranian opposition activists Monday in a noisy demonstration outside the White House, urging President Obama to discuss what may soon happen at a refugee camp as the United States leaves Iraq. The Iraqi government plans to close Camp Ashraf northeast of Baghdad at the end of December, without clear assurances the refugees will be protected against attacks by Iraqi forces and reprisals from neighboring Iran. Copyright 2008-2014. All rights reserved. Human Rights & Democracy International, Inc.